VANCOUVER — The Union Titans reign in the rain. They reign in close games, too. Oh, and they continue to reign in the Class 4A Greater St. Helens League. 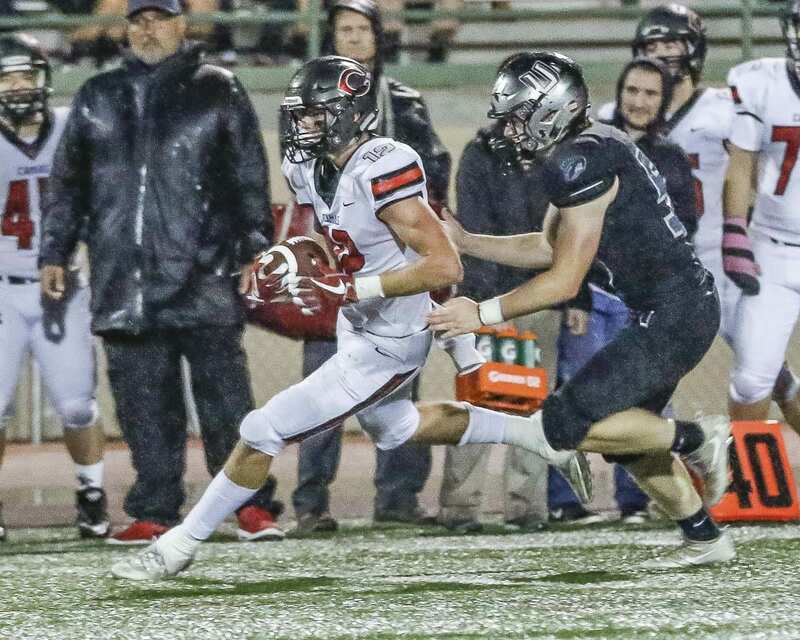 Aidan Hoyt had two interceptions, including one in the end zone in the fourth quarter, and the Union defense did its job for most of the night in a 14-7 victory over the Camas Papermakers at McKenzie Stadium. Union improved to 9-0 and finished the 4A GSHL season with a 4-0 mark. Camas, 5-4, dropped to 3-1 in league play. 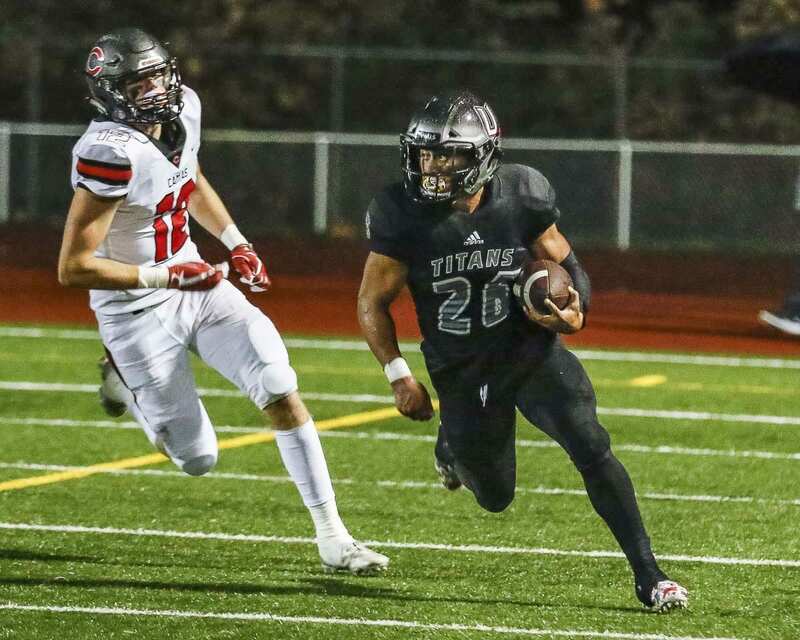 The Papermakers had the ball three times in the second half trailing by seven points but could not get the equalizer against the undefeated Titans. Five of Union’s victories this season have come by a touchdown or less. Yes, the Titans are tested, too. Oh yes. This is not just a second consecutive league title to celebrate for the Titans, but a second win in a row over a respected rival. Back after missing the past two-and-a-half games due to injury, Victor set up Union’s first touchdown with 52 yards rushing on the team’s first series. “It felt like something was missing out of my life when I was not playing,” Victor said. Alishawuan Taylor scored for the Titans on that first drive for a 7-0 lead. Union made it 14-0 on a 3-yard touchdown run by Siofele after the team’s second drive. At that point, Camas had two drives for a total of eight plays for eight yards. Union had 26 plays for 163 yards. But the Camas defense came alive, shutting out the Titans the rest of the way, keeping it close. seven point game. Jamison finished with a game-high 138 yards rushing. The Camas defense would come up big again and again, but the Union defense would top it with bigger plays. Hoyt had the interception of his life early in the fourth quarter, with his pick in the end zone. Hoyt said he started the year as a third-stringer. Union would kill five minutes of clock on the ensuring possession. Siofele ended up with 108 yards rushing, including a 19-yard gain on this drive. But the Titans missed a field goal, giving Camas one more shot. The Papermakers converted one fourth down and eventually got to Union’s 37-yard line. The drive stalled, and back-to-back incomplete passes led to a loss of downs with 1:17 to play. Victory Formation for the Union Titans. 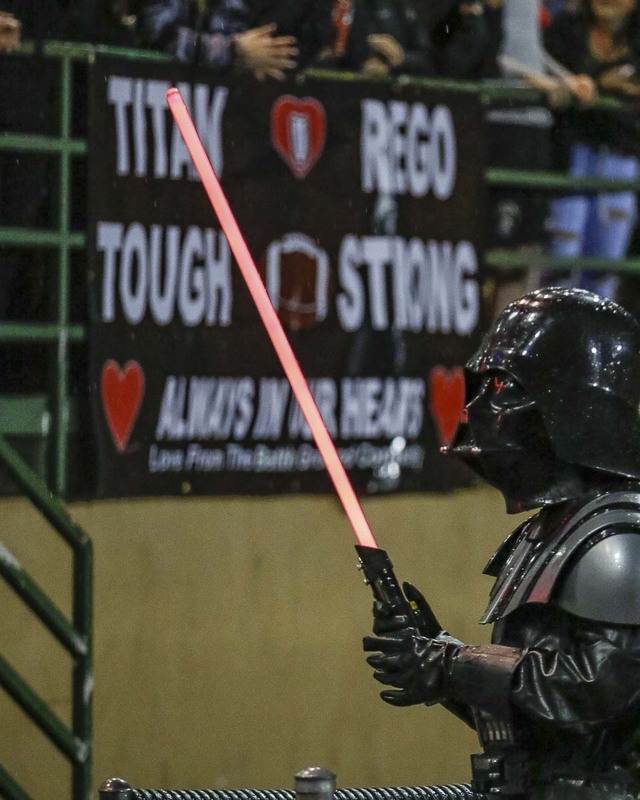 Playing through constant rain, the Titans managed 349 yards of offense. 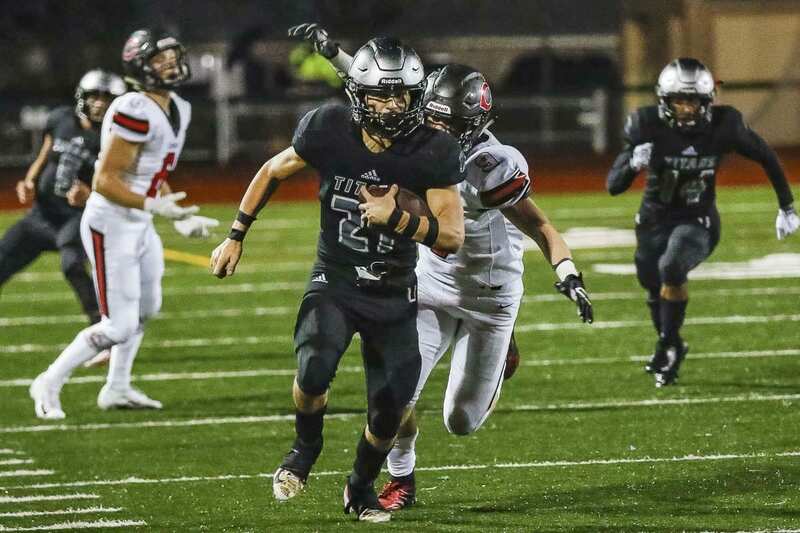 The Union defense held Camas, a team that scored 48 points last week, to 225 yards. Camas was playing without injured quarterback Andrew Boyle. No matter who played, though, the Union defense was up for the challenge. That is exactly what happened. That is how the Union Titans won their second consecutive league title. Notes: Union will host a Week 10 state preliminary round football game next week. Camas goes on the road. Skyview, the No. 3 seed from the 4A GSHL, also will be on the road. The winners of the Week 10 games advance to the state playoffs. RUSHING: Camas — Jamison 23-138, Jake Blair 3-(minus 4), Jacques Badaloto-Birdsell 12-24. Union — Siofele 20-108, Lincoln Victor 11-75, Nile Jones 10-37, Taylor 1-1, Isaiah Jones 1-13. PASSING: Camas — Blair 3-12-2-67. Union — Victor 8-16-0-115. 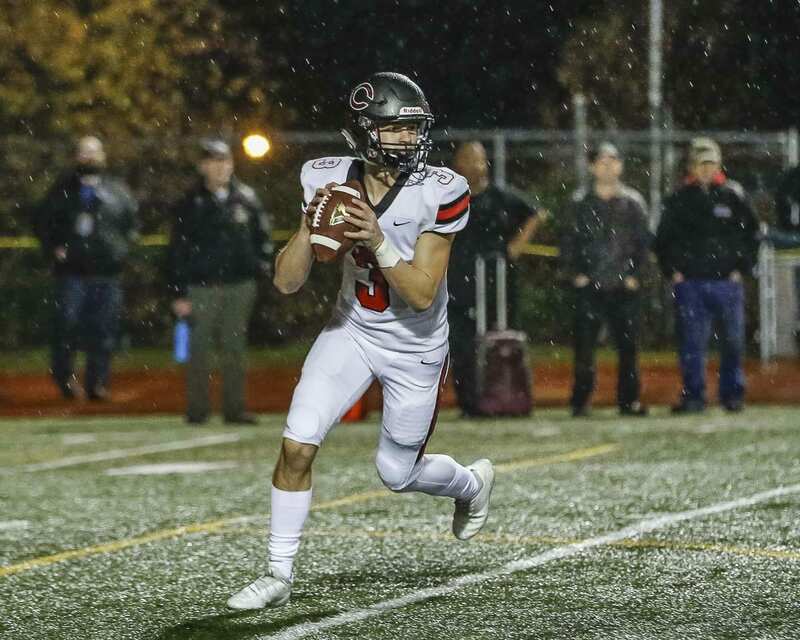 RECEIVING: Camas — Joey Schnell 2-38, Luc Sturbelle 1-29. Union — Siofele 2-15, Alex Vallejo 4-63, Darien Chase 2-37.